The absence of brick-and-mortar bingo halls in the state of New Jersey might indicate that this game has not been very involved in the gambling movement within the state. The introduction of New Jersey online bingo options could alter that dramatically. The game of bingo has changed a lot in the last decade or so, specifically with the emergence of USA online bingo. While there may be some casinos on the Boardwalk in Atlantic City that offer bingo games as part of their casino game repertoire, online bingo has taken on a life of its own and is probably much more robust and active than the average non-bingo gambler realizes, making the virtual version of this game a viable part of the New Jersey online gambling market. Currently there are not any state-based online bingo programs available other than the possibility of a few random bingo type games offered at one of the online casinos recently launched as a part of the new state sponsored online gambling offerings. 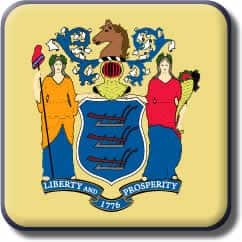 What many players may not realize is that multiple New Jersey online bingo options already exist, and they are legally licensed, certified, and regulated outside of the US, located within a governing jurisdiction which has already legalized online bingo for its respective territories. This section of our guide has a twofold purpose. First, it is designed to introduce gamblers in New Jersey to the online bingo platform. Secondly, it is designed to provide clear and concise information regarding the availability and legality of New Jersey online bingo. It is our intention that players in New Jersey who visit this guide will be equipped to make informed decisions regarding if and how online bingo fits into their gambling purview. We will discuss state-based and offshore options, what the law says about online bingo in New Jersey, and how you can find safe, trusted, and legitimate online bingo options. We have created other guides for residents of the Garden State, including New Jersey online casinos, poker sites and sportsbooks. Is Online Bingo Legal In New Jersey? There are a number of legally licensed and certified online bingo sites which accept players from New Jersey and all of the United States. These bingo sites are located outside of the US within jurisdictions that have already legalized online gambling for their region. Because of this, they are able to legally offer online bingo gambling services to players in the US or anywhere that they like. There are not any state or USA federal gambling laws that prohibit players from participating in legally licensed offshore bingo gambling. The kicker is that the site does have to be operating legitimately within the industry, meaning that their licensing and compliance certifications must be issued by a legitimate governing body located offshore, and their regulatory oversight must be administered by a respected jurisdiction. So to sum things up, it is legal to participate in online bingo gambling at a legally sanctioned online bingo site. It is currently not legal to operate an online bingo Hall within the state of New Jersey. That status may be short-lived based on their position towards online gambling, however for the time being, legal offshore bingo halls are the best option for New Jersey players. The same holds true for offshore options of New Jersey online poker, casinos and sportsbooks. You can learn more about the gambling laws in this state by visiting our guide to New Jersey gambling laws. Our team collected all of the names of potential online bingo sites, put each brand through an intense review process, resulting in a refined listing of the industry’s safest, most legitimate, and most trusted online bingo sites accepting players from New Jersey and the USA in general. We have verified that they are each legally and legitimately operating within the industry, that they are compliance certified and have employed an advanced security profile to protect players and their sensitive data. The bingo sites that you see listed in the table below have been reviewed very carefully, and are the ones which we found offer players the safest, most reliable, and overall pleasing online bingo experience. You will also find recommendations for New Jersey online sportsbooks, casinos and poker sites within this guide. Are There Online Bingo Bonuses For New Players? Most of the premium online bingo sites include a list of daily promotions that change often. They all offer new players a welcome bonus that is typically structured as a match deposit bonus that is tied to your initial deposit, a series of deposits, or reload deposits. The bingo site will agree to match a certain percentage of your deposit up to a designated maximum amount. These bonuses do carry wagering requirements, so be sure to read through the terms and conditions before claiming any of them. You absolutely can! Each bingo site includes free games in their list of daily promotions. This is a great way to get used to the online gaming environment and to try out new games or patterns to see how you like them. It is not unusual to see a free game that allows players to win cash or a prize of some kind. Can I Play Online Bingo From My Mobile Phone Or Tablet? Yes, mobile bingo is definitely available to NJ residents. The automatic dauber function ensures that your smarphone display is not too small to manage many cards at once. These mobile bingo sites are not apps from the appstore but rather are web based, mobile optimized applications that utilize responsive technology for compatibility with almost all mobile devices and operating systems. What Type Of Experience Can I Expect When Visiting A New Jersey Online Bingo Site? Online bingo really is a unique online gambling experience. Most legitimate Internet bingo halls offer variety of games including 30 ball, 75 ball, 80 ball, and 90 ball bingo. In addition there are hundreds of patterns offered for each game variety. The games often take place in beautifully themed chat room environments, and games range from free and one penny buy ins up to high roller status options. The user interface provides stunning 3D graphics, state of the art digital sound, and a well designed website overall. You can play as many cards as you like, limited only by your interest and bankroll. It’s easy to play multiple cards because they are marked for you electronically, hence you don’t have to personally manage the cards’ results yourself. In between the rounds of bingo in each chat room, players have the option of participating in chat room side games. This is where the social component comes in. The chat games are managed by a moderator who is responsible for overseeing the game, interacting with players, and ensuring that new players feel welcome and understand how to play. Players have the opportunity to make friends, chat with other players, and it has been reported that some romantic relationships of been sparked from chat room side game interaction. Many players claim to have made good friends and enjoyable acquaintances. These games also offer additional chances to win prizes and money. The side games are optional and nobody is required to participate. So if socializing in the chat room is simply not your thing, then that’s fine. Many players choose to participate in online bingo specifically for the social elements which are unique to this venue. Online bingo halls also offer casino side games that typically include slots, video poker, scratch off cards, and sometimes Keno or other specialty games. The specific game selection varies from site to site.